At TSV Sound and Vision, our event production team has worked with many different companies on a variety of events and is experienced in creating memorable A/V effects within our client's budgets. As the holiday season approaches, we wanted to share a recent project we worked on with Tito’s Vodka. 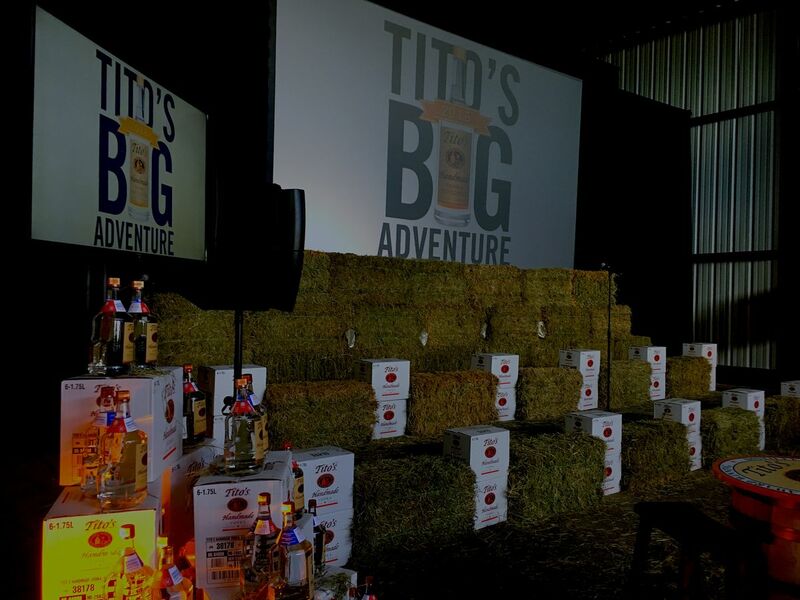 Our holiday party production team has provided event production services for Tito’s for many years, and we love watching their parties get better and better! Read on to learn more about how we transformed a large warehouse space into a party atmosphere for this year’s holiday party held at the Tito’s Vodka Distillery. TSV provided a JBL VRX sound system to cover the entire space with high-quality audio. The sound system was used for the band, speeches, and video playback. A 9x16 rear projection screen and 16,000 lumen projector from Christie Digital was the focal point of the event, with 70” LED monitors spread throughout the space to provide coverage in areas with limited viewing angles. TSV provided a convention wash for the main stage, and LED uplighting throughout the entire event space added color and motion. TSV also provided black velour pipe and drape to create a backdrop for the events on the main stage, as well as to close off the food preparation areas from the event floor. The previous vendor that Tito’s hired for these events had a very limited set of solutions that they could offer, which resulted in a less effective and appealing event design. With TSV’s huge inventory, we’re able to offer a variety of A/V solutions that solved the problems the warehouse venue presented. We were able to provide brighter projection to overcome the light in the space, pipe and drape to hide their food prep area, and on-site staffing to see the event through to a successful completion. After the event, the client was very happy with our event production services, and we look forward to working with Tito’s on future events! At TSV Sound and Vision, our experienced team and expansive A/V inventory give us the tools and expertise to turn any venue into a stunning event space. Contact us today to learn more about our event production services!